I see the word “fdd” and I think “floppy disk drive.” I don’t know why, but it just pops into my head. This fdd is not a floppy disk drive at all. You could use it to manage and arrange your floppy disk drives though, and in that sense it’s very helpful. StreaK left a comment a few days ago about it, and it’s one of the few cataloging tools I can remember for the console. Personally I blame that on the proliferation of high-end, high-performance database tools that are just as easy to use at the command line of your home PC as they are on high-end servers or business-grade machines. Regardless, fdd is very impressive for its scale. 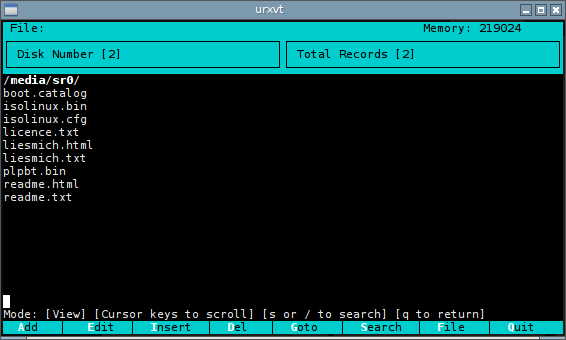 The full-screen approach is nicely arranged with key commands along the bottom, and stretches to fit any size terminal — even smaller than 80×24, which is an accomplishment. Color is good, with easy-to-read highlights and nicely spaced menus for adding or editing records. fdd is showing its age in some places; it has both 720k and Zip-Disk as options for disk media, even if CDROM and DVD are options too. 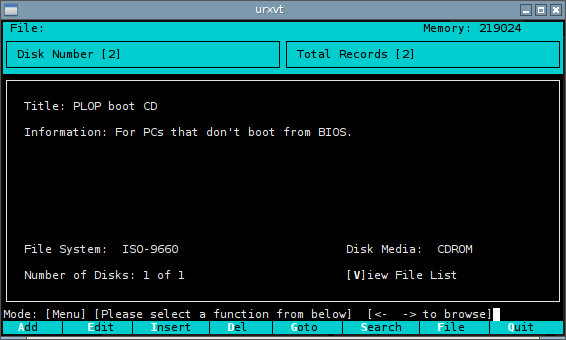 I tested fdd by adding a few dull CDs to it, and was pleased to see the ability to read the directory of a drive, and add it automatically to the record, which you can see above. If you’re cataloging collected disks of photos or documents, this could be a huge help. The home page, as you might have already realized, is long-gone, but the almighty archive.org has an impression of it. Source code is available here, if you want to build it. I didn’t find fdd in either Debian or Arch. Overall, fdd is a great cataloging tool with good options and a flexible interface. It’s obviously left over from another generation, and now that we’ve arrived at the era of online storage and terabyte-sized media, I don’t know if fdd will find a home or not. This entry was posted in Linux and tagged catalog, database, disk on 2015/04/03 by K.Mandla.